Packaged in an attractive, durable carrying case. 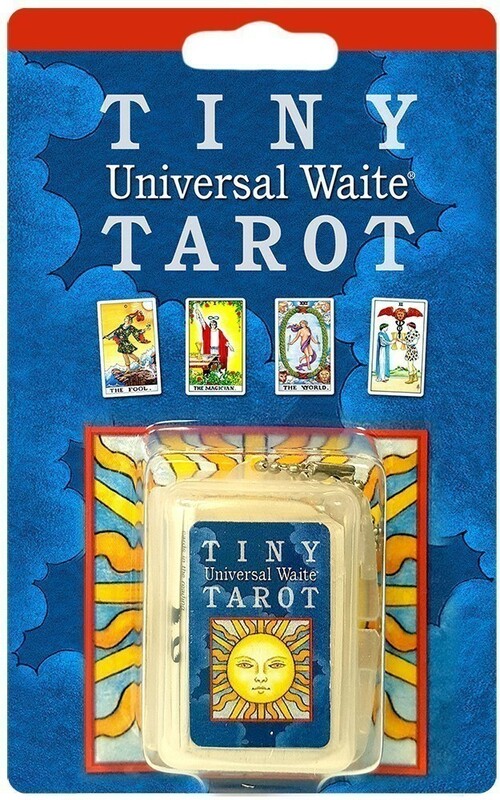 Includes 78-card Tiny Universal Waite® Tarot Deck and instructions. Also see: Universal Waite® Tarot Deck, Universal Waite® Tarot Deck/Book Set, Universal Waite® Tarot -- Premier Edition, Universal Waite® Pocket Tarot, Tiny Universal Waite® Tarot, Quick & Easy Tarot, Quick & Easy Tarot -- Premier Edition, and The Pictorial Key to the Tarot Book. Case measures 1.375" x 1.75" ; Cards measure 1.1875" x 1.1875" ; Blister pack measures 3.5" x 5.5"
It’s an itsy bitsy teensy weensy yell… Wait, no it’s not. However, the Tiny Universal Waite Tarot Keychain is probably the most adorable little thing in the Tarot world. This charming, petite but complete 78-card deck which is illustrated by Pamela Coleman-Smith and re-colored by Mary Hanson-Roberts measures in at 1 3/8” tall by ¾” wide. The deck and Little White Book are housed in a hard, clear, plastic container that snaps closed and feels pretty secure, but does not “lock” closed. The container has a ball chain – Keychain attached to the outside, which can be used to secure the container to one’s own keychain. The set comes in a cardboard hanging display type of package. The deck is a traditional Rider-Waite-Smith with Courts titled: King, Queen, Knight and Page. The Suits are: Swords, Wands, Cups and Pentacles. Strength is number VIII and Justice is XI. The softer coloring done by Mary Hanson-Roberts is fresh and appealing. The back of the deck is done in blues and features an eclipse with stars above and below and is reversible friendly. The deck is not in order when it arrives. The cards themselves are flexible, but there really is not a way to shuffle it due to its size. I would suggest either mixing them around on a smooth surface or dropping the deck in a small bag, shaking it and drawing from the bag. The cards feel like they may be easy to bend and there are perforation marks on each side. The LWB is a folded strip of paper that measures 9 ¾” long x 1 ½” wide. It features keywords for each of the Major Arcana and the Minor Arcana in suit order. It also covers a “10 Card Spread” which is laid out similar to a Celtic Cross but the positions have a bit of a different meaning. Once I unfolded the LWB, I did have a challenge folding it back the way it came. This deck may not be the best to use as a reading deck for those who have issues with muscle control in their hands or poor vision. This deck can be just the thing for those Tarot craft projects. At the Bay Area Tarot Symposium I have witnessed attendees sporting this fashionable deck, made into earrings and necklaces. It could also make a wonderful gift or stocking stuffer for your favorite Tarotist. 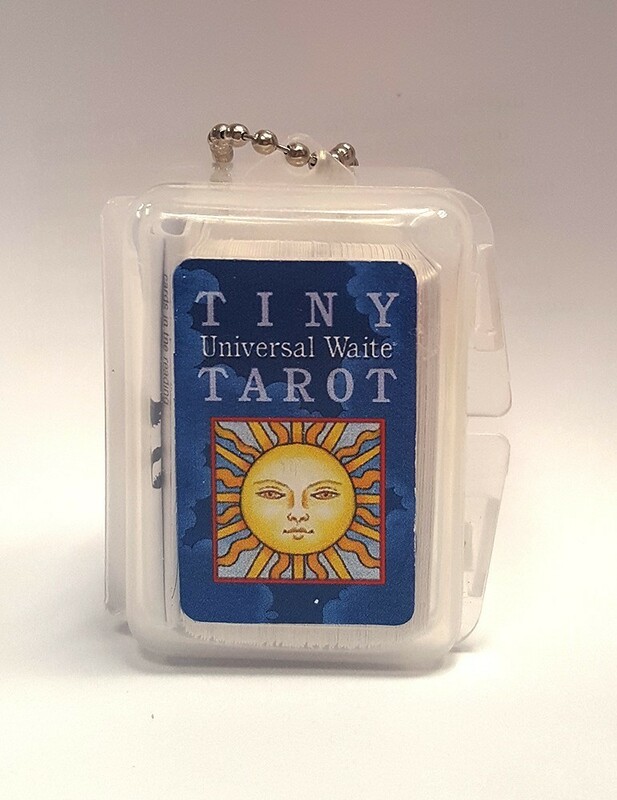 The Tiny Universal Waite Tarot Keychain is the perfect size to use as an on the go deck when one doesn’t want to carry a full size deck. It is the ideal size to go on a keychain, in a back-pack, purse or to carry in the glove box.